Before you freak out, I do NOT have swine flu. There´s a medical emergency here, with a lot of people dying every week. I´m taking all the needed precautions with my customers and myself, and luckily my life rarely involves being in crowded places. I do have a regular flu, this makes it harder to do simple tasks, like tiling rooms. After a tough week I´m feeling better now, so things will move much faster. So, about the misterious lower part of area 4... I already did the basic rooms, there´s a lot of tiling left, and it still doesn´t have any scripted parts. What I can tell you about it without spoiling too much: It´s not too small, there´s an item to be collected, there might be a miniboss waiting for you, it´s completely optional (so, no Metroids down there). All the rooms of area 4 are done, they still need some tiles, and the outside of the tower is still made of dull square blocks, but it´s playable. After the first test I noticed how small and simple this area is, compared to eralier ones. I did add some scripted surprises inside the tower, and even if it´s bigger than the original, it´s not enough. 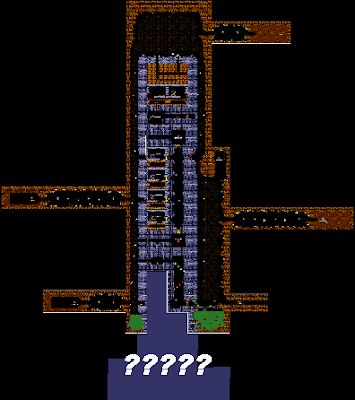 So, I was thinking on adding some extra rooms below the tower, so what we really visited in Metroid 2 was the upper part of a bigger structure, buried inside the cave. The Chozo are one of the most mystical and advanced civilizations of the universe, and they decide to make a tower in the deep underground of a dangerous planet... they must have a GOOD reason to be so unpractical. Anyway, another problem I found is the main cave room. In this case, rooms are parts of a level that are separated with transitions, it could be a single screen, or a huge cave. The bigger the room, the slower the game gets.